Ole Tersløse, who among ten other danish artists just has participated in the group show GENIUS LOCI curated by Dr. Barbara Aust-Wegemund, has created a site specific installation now on show at Vesthimmerland Museum - designed by the world famous danish artist named Per Kirkeby. Vesthimmerland Museum is a hybrid museum combining archeology and art, and to get to the high-ceilinged room, where Ole Tersløse's installation called Angling Boy is exhibited, you must walk a narrow way through small rooms showing archeoligical stuff and finally down a spiral staircase. After the long horisontal walk and the final "trip" down the staircase, you feel that you've ended at the bottom of a lake with a diffuse toplighting coming from the roof windows. Here you are confronted with a two-metre-long 3d printed earthworm used as fish bait by a boy shown at a picture hanging from the wall. 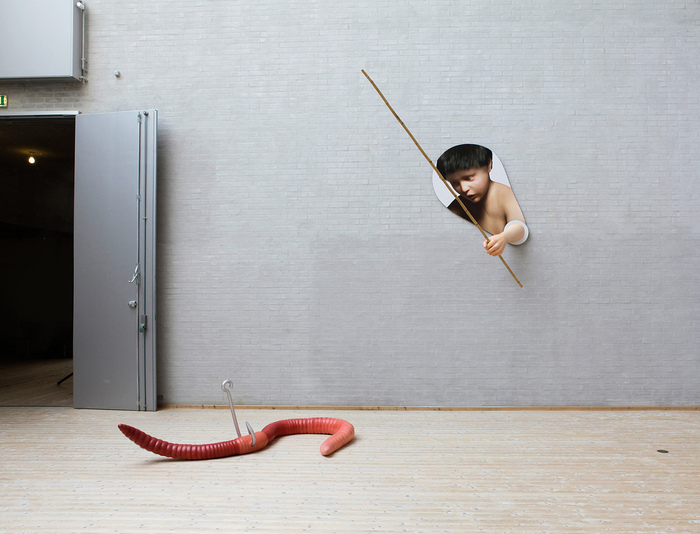 The boy penetrates the picture space with a 3d-printed arm holding a bamboo cane used as fishing rod. The viewer of the installation has ended at the same level as a fish - ready to grap the earthworm and so being hooked by the fishing boy. No matter how cute and humble he may look he is actually a cannibal fishing for the innocent poeple visiting the museum to get an experience of art. The installation is Ole Tersløse's contribution to a groupshow with the art group TRANS-FIGURATION founded by Henrik Godsk and Ole Tersløse. The other participating artists are Maria Torp and Tanja K Jensen. 22.10 the group will have their first exhibition abroad at Mark Rothko Art Centre in Daugavpils, Latvia. The art Centre is a museum for Mark Rothko but hosts exhibitions with contemporary artists as well. The TRANS-FIGURATION group will try to actualise figuration (the recognisable object in visual art) as a dynamic form in constant change, one that problematizes and enters into a conflictual relation with the issues existing outside of the artistic space that it seems to refer to. "Today the sharp distinction between figurative and abstract art has become blurred and replaced by many artistic strategies in which the two modes of expression are united to create new and unexpected interpretations of our volatile and infinite world. The figure, which has long been denied access to the artistic realm, thus resurfaces, but in a new context and with new challenges. Two Danish artists, Ole Tersløse and Henrik Godsk have created surprising new works within this intersection by establishing an artist group which has been named TRANS-FIGURATION, because the figure performs in an artistic realm that is characterized by unpredictable, directly chaotic transformations and many transitions between illusion and reality, which appear both in the artworld and in society itself."